A Kentucky boy and a DC gal. This is the story of two newlyweds beginning their new life together in the Nation's Capitol. Follow us as we begin to renovate our first home, a 1910 Federal-style porch front in heart of Capitol Hill East. I love how the triptych (three pieces forming one work of art) covers a large amount of space. 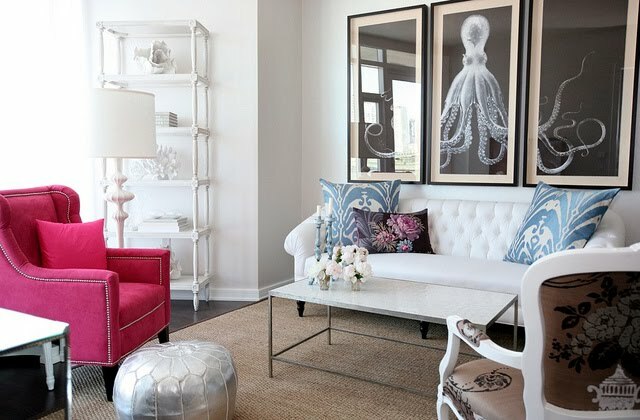 It's called Lord Bodner's Octopus Study, and I thought it would be the perfect piece to go above our sectional. A reproduction of this print can cost anywhere between $2000-$4000! That doesn't including the framing and mat which would also drive up the price. Since Justin would kill me if I spent that much on anything, I decided to search the internet for some cheaper options so that I could get the same look for less. I saw similar octopus prints on poster websites but the colors weren't quite what I was looking for. Eventually, I came across the design blog Splendid Minta, who offered a great do-it-youself tutorial on how to duplicate this triptych. 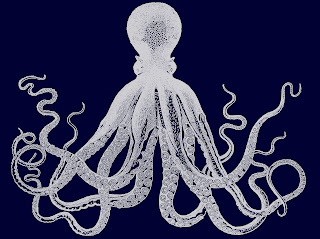 Basically, she took free octopus clip art and used a design imaging tool, such as Picnik to design her own color combinations. 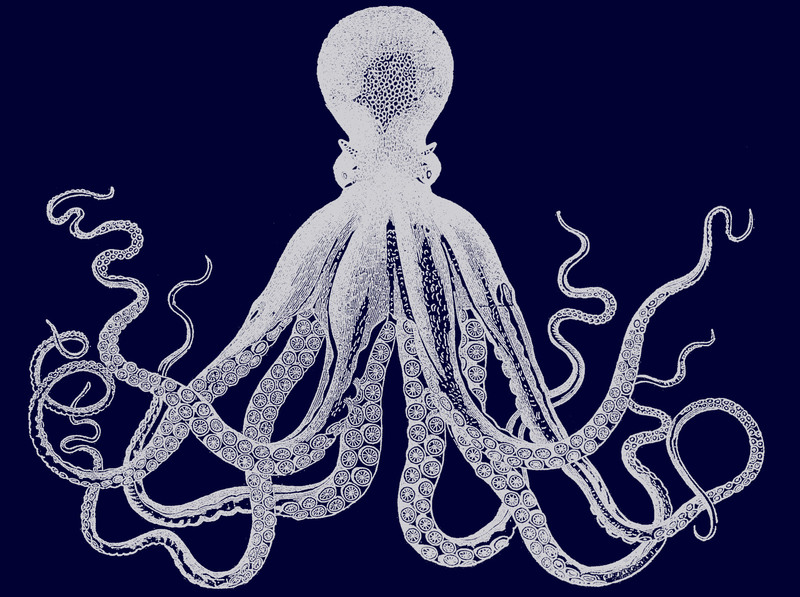 I stuck with the blue and white color combination and used the octopus clip art to design the image below. Next, I took it to Michael's to get framed. They were having a 60% off sale on custom framing, but it was still a little more than I was expecting to pay. However, once I thought about it--the custom sizing, custom mat, and the fact that I could put something different in the future (maybe some interesting wallpaper) I figure that it was worth the investment (or at least that's what I had to convince myself ;). A few weeks later, I was able to pick up the finished product and it was ready to hang. Too bad we weren't quite ready to hang it because we were off on our measurements a few times. Let's just say that that the future owners of this home will have to patch up several holes in the living room walls. Whoopsy. Excuse the crappy cell phone photo. I was trying to get a shot with the least amount of glare, but you get the idea. I am so happy with the finished product and even happier that I didn't have to spend thousands of dollars for it! Folks, I have had several request for the original image I used to make this triptych. Unfortunately, due to blogger size restrictions I will not be able to post that image in this post, nor will I be able to email you the image due to email attachment limitations. The link to the Splenda Minta website (which is what I used) I believe has the best instructions on how to do this yourself. Happy DIYing! bahhhh... Justin is sleeping hahaha.